We’re nearing the end of Hearty Soup season. And I feel like it got short-shrifted this year. Bone-warming broths, stews and soups weren’t really needed so very much this winter. And it’s too bad—hearty soups are my favorite to make. 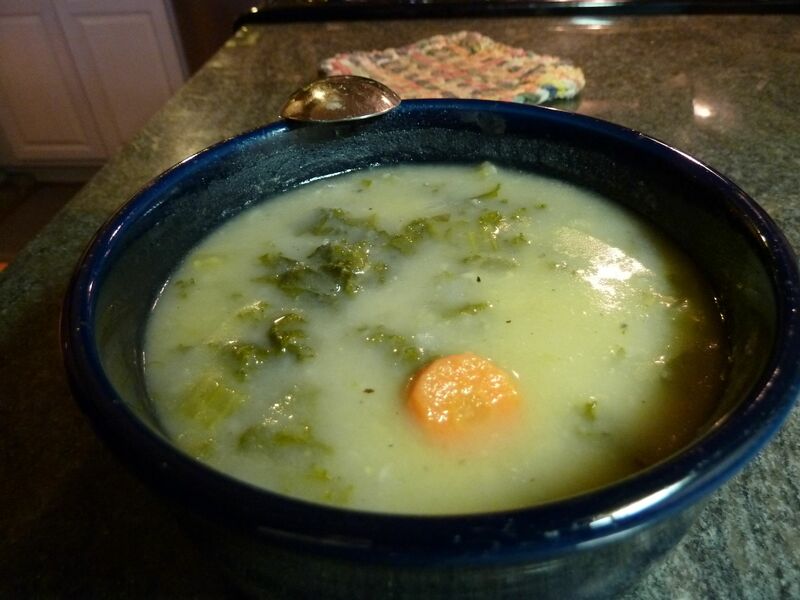 We were able to squeeze in a batch of Potato & Kale Soup earlier this week. Thank goodness, because a winter soup season shouldn’t go by without this cooking on the stovetop at least once. Jennifer and I tag-teamed this recipe. I chopped and prepped late in the afternoon, then she came home and cooked, giving it her special touch while I lunged and downward-dogged and shavasana’d. The potatoes and kale really satisfied a hungry yogini. Full disclosure here: Full credit goes to Jennifer, who got this recipe from a soups class she took back in the late ’90s. We’ve adjusted a bit here and there. But not spectacularly so. -Heat oil in large Dutch oven over medium heat. Add onions (and leeks if you have them) and sautee until soft and translucent. -Add potatoes, parsley, whole carrots, whole celery, bay leaves and 6 cups water or broth, and season with salt and pepper (several good pinches of salt/twists of the pepper grinder). Cover. Simmer on low to medium low for about 45 minutes. -While the soup is simmering, wash the kale and remove the thick ribs. Tear the kale into a size that won’t annoy you – i.e. not too big. You’re going to steam/cook the kale in about a cup or two of water/broth in a high-sided skillet with a lid. Boil that water, add the kale, cover, and let it cook for not that long – 4-5 minutes. You want it tender but not melty-mushy. Drain out the water and set the kale aside. -When the soup base has simmered 45 minutes, remove and RESERVE the carrots. And remove and DISCARD the celery. Puree by using a light touch with an immersion blender—you want part of it pureed but you still want some chunks of potato in there. OR, just puree half of the soup in a food processor and return it to the soup pot. -Stir in kale. Chop the reserved carrots, add them back in there, too. Heat until nice and hot. Give it a taste – add salt and pepper as necessary. -Here’s the last bit that is Jennifer’s touch and it’s completely optional: Add a tad – let’s say a 1 tbs – of sherry vinegar. Not so optional, uh? That’s good stuff, that soup is. A nice “creamy” soup—and absolutely no cream! And now that I think about it, it’s vegan. Bonus. What’s your favorite hearty soup recipe? Drop in a comment and let us know. Dainty’s been back from California a week, but still hasn’t gotten in the groove. Catching up on work, volunteer meetings, dinners out, etc, have given me zero fodder for posting. And you’d think with a weekend just behind me, I’d have plenty to write about. I think maybe I made a batch of steel-cut oatmeal for breakfast—that’s about it. And a loaf of bread, but it was a workhorse kinda loaf—nothing spectacular. I spent the weekend working on a homey project—painting the window well in the bedroom. Sure, I saved several hundreds of dollars doing it myself, but I sacrificed several million brain cells in the process (just say no to paint fumes). It’s a project that’s been on my list for about a year and I’m glad I got it done. And while I was scraping and painting, Jennifer was making a big batch of vegan soup to weekday lunches. And this is a good one. -Heat oil in large soup pot over medium heat. Saute onions and leeks until soft—abou 10-15 minutes. -Add potatoes, parsley, whole carrots and leeks, bay leaves, salt and pepper. Boil, cover and simmer over medium low for 45 minutes. -While that is simmering, cook kale in 2 cups boiling water in a skillet. Cover tightly and cook for 4-5 minutes until tender. Drain and set aside. -After 45 minutes, remove carrot, celery and bay leaves from soup. Reserve the celery and carrots but chuck the bay leaves. Puree half the soup in a blender. OR, an immersion blender is awesome for this—just whirr up (who says that? Jamie Oliver?) half of it right in the pot. Stir in cooked kale. Chop up the carrots and celery and return to the pot. Heat the soup through again. Salt and pepper it if you need to. Tada! A vegan alternative for lunch. Sounds like this could use some bread. I think I’ll do that right now. Sometimes dinner is just a bowl of gussied-up bulgur. Not that bulgur is meaningless or anything. Not in the least. It’s a whole grain, high in fiber, packed with good nutrition—it’s awesome just for that. Throw in its great taste and texture, it’s a real winner. But when I say “sometimes dinner is just a bowl of gussied-up bulgur,” I mean some days you just don’t want to put a lot of effort into the evening meal. Aside from pulling a box of frozen somethin’ out of the freezer, fancified bulgur is an easy solution. Two weekends ago at the Somerville Winter Farmers Market, one of the vendors—she sells Middle Eastern prepared foods—shared a quick-and-easy bulgur recipe with Jennifer and I. Having just come home from a long weekend in Vermont, we decided to take mealtime easy and whip up the bulgur. Jennifer prepped the dish, I stood by and watched. Full credit goes to my favorite chef. -Chop onion. In a medium pot, saute onion in olive oil over medium until somewhat translucent. Add tomatoes. Season with salt and pepper. Heat until bubbling, then turn down to a simmer. Let simmer gently while you prep the kale. -Add kale to tomato onion mixture, and try to combine with tomatoes, but don’t try too hard. Cover. Let simmer away for 15 minutes. -After 15 minutes, kale should be mostly cooked. Stir in a cup of bulgur. Cover and let stand for 15 minutes. The bulgur should soften and expand during that time. -Dish up in bowls as a light meal or spoon alongside an entree. Top with a sprinkling of feta cheese if you wish (and I wish). You are currently browsing the kale category at The Dainty Dot.